VIP Weddings began as a small family business in Ballina, Co Mayo, over ten years ago and has been growing steadily since, now proudly known as one of the biggest and most experienced Wedding and Styling businesses in the West. What makes VIP Weddings different? VIP Weddings and Events not only provide a hire service, but is the only Wedding and Event Styling company based in the West of Ireland who offer completely bespoke & specially designed decor for your event. For couples who enjoy the planning and the creativity themselves, we can hire individual items that you may need to complete your look at a fraction of the cost of buying them. We hire everything from Chair Covers and Sashes, to backdrops, draping and table-centres, and table plans for your reception or event, and with everything for every type of ceremony such as lanterns, topiary trees, Couples Chairs, and floral arrangements, VIP Weddings & Events is your one stop shop to create the Wedding you have always dreamed of! Whether it be an era, a shared hobby, or a common interest we can help you to incorporate any theme tastefully and elegantly, even if it means designing and creating one off props for your day. 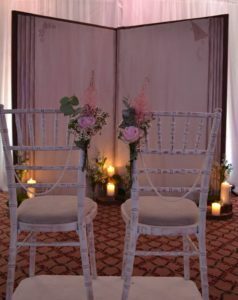 As no two couples or events are the same, and with such a large selection of beautiful locations to choose from in the West of Ireland, we have never had two weddings styled the same, each event’s styling has been completely unique to the commissioning couple. With a huge array of décor and props, we can help to create any look or idea you may have, all at a very reasonable cost, saving you not only money, but the time and stress of setting up and organising décor in the days leading up to (or on the morning of) your wedding.